Baturday News is a weekly blog written by Rachael, a high school student, bat advocate, and Save Lucy volunteer. Rachael’s interest in bats was sparked by the big brown bats that used the outside of her former home for a winter roost. She now enjoys watching the bats fly over her home on summer evenings. Rachael has been writing the Baturday News for over three years. Blogger Rachael likes to challenge us by featuring bats for which no shareable images exist! 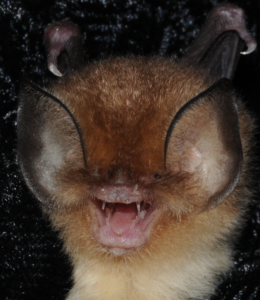 Please enjoy this lovely photo of a different, but similar, funnel eared bat! Photo by Matthew A Emrich via WikiCommons. Hi everyone! I hope you all had a good week! It has been another terrible week for weather and it looks like things aren’t going to get better any time soon. Now that Hurricane Harvey has finally moved on, the people in south eastern Texas are faced with picking up the pieces the hurricane left behind. And now, there is another hurricane. This one is named Irma. I would like to dedicate this week’s blog to everyone affected by this hurricane. Irma has spent the last few days in the Caribbean. Many countries have been hit by this hurricane. People in Antigua, Barbuda, St Martin, St Maarten, Anguilla, St Barts, US Virgin Islands, British Virgin Islands, Puerto Rico, Dominican Republic, Haiti, and the Turks and Caicos Islands have all been affected by this storm and the damage has been devistating. As I write this, Irma is expected to make landfall in Florida within a few hours. My thoughts are with you all. I thought it would be nice to research some bats that live in the Caribbean. There are a lot of cute ones! The Bahaman funnel-eared bat is absolutely adorable! They are part of the family Natalidae and are endemic to the Bahamas. The Bahaman funnel-eared bat was discovered in 1903 and is listed as near threatened. These bats are small, have long tails, big ears, and reddish or chestnut brown fur. Their ears are funnel shaped. This funnel shape helps them echolocate. The bats’ thumbs are so short that they are mostly hidden in their long, narrow wings. These bats only live in caves in the Bahamas and not much is known about them. I hope their colonies survived the hurricane and they are all doing well despite the weather. I would like to wish everyone in the path of Hurricane Irma good luck. And, let’s all hope that Jose stays out in the ocean and doesn’t hit the islands that have already suffered so much.